Why Run on Mother's Day? Why not?! What better way to celebrate your mother (or the woman or women in your life) than by running alongside her, in honor of her, in memory of her or just because you feel like running. Husbands, sons, daughters, aunts, uncles, mothers, fathers, in-laws and all family members are invited to run in this celebratory run! At the same time you will be helping to raise money for 1 of Us - a local women's cancer charity that provides financial assistance to women fighting cancer - to help someone else's mother. Check the News page for the latest updates and announcements. Come to Wake Forest to run or walk through the downtown streets to get energized and to work up an appetite before heading back home to whip up those pancakes for your mother. Or better yet, decide which restaurant in Wake Forest you can take her to where everyone can rest after the fun morning. The event is stroller-friendly and pet-friendly (pets on leashes) so don't worry about getting a babysitter or dogsitter - we don't want anyone in the family left behind! All mothers will be recognized with a special bib for this run. If you want to be celebrated as a mother, make sure to check the "Yes, I am a Mother" box during registration. In addition, all women cancer survivors will receive a discount for participation in this run and for letting everyone celebrate you as a SURVIVOR! Email Nancy at nancy@fsseries.com before registering so you can receive your special registration code. This is a 5k course run entirely on the streets of Wake Forest. There will be a water station around the first mile marker that you can also stop at a second time on the out-and-back course. All registered runners will receive official times, and are eligible for awards. Check out the course information here. 10:00am: Pack up and continue celebrating your Mom! 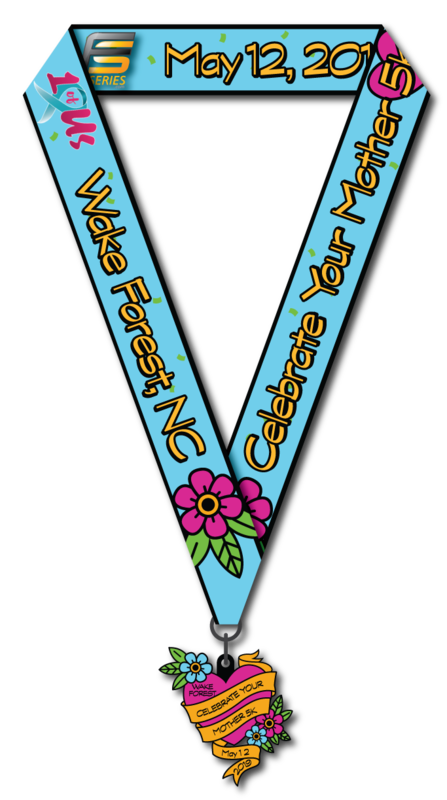 Runners will receive the official 2019 Celebrate Your Mother 5K T-shirt, a finisher's medal, and a SWEET TREAT! All finishers will get special sweet treat from a local business - watch this space for more information. Make this part of your Mother's Day tradition! The children can have fun in the Bounce House, and get a special face painting from the face painters, while the mothers and the rest of the family can spend the morning getting pampered by the sponsors in our vendor village. The top three overall female and male winners will receive a special award. The top three overall female and male masters winners will receive a special award.